Enjoy this play on the typical solitaire engagement ring with this fun and playful tension set 1 carat violet tanzanite engagement ring! 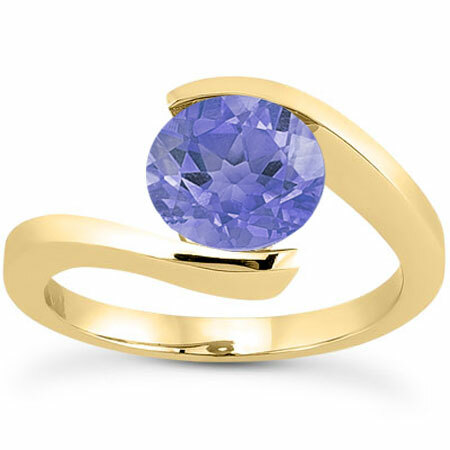 Set in 14K yellow gold, Apples of Gold Jewelry offers a sparkling light violet tanzanite gemstone, round cut and of 6.5mmm generous size, wrapped in an interesting twist of a ring! The tension set ring is unlike anything else you've ever seen - it's almost magical! The A rated gemstone will sparkle and shine its way into your heart with this unique beauty! We guarantee our Tension Set 1 Carat Violet Tanzanite Engagement Ring, 14K Yellow Gold to be high quality, authentic jewelry, as described above.